Director Tobe Hooper wanted something big to follow up his success on “Poltergeist,” and turned to this lumbering science-fiction thriller that cost plenty and didn’t make a dime. Steve Railsback (“The Stuntman”) stars as a United States astronaut who is the only survivor of a mysterious shuttle disaster. The mission turned ugly when the crew decided to investigate a mysterious craft hiding in the tail of Haley’s Comet. While the shuttle crew doesn’t make it back to Earth alive, their cargo, space vampires, do. 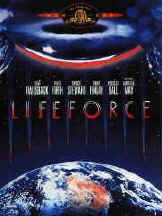 Set mostly in London, “Lifeforce” is a Master’s Thesis in excess. While some of the visual effects seem archaic by today’s standards, it’s fun just to sit back and see what the filmmaker’s wanted to accomplish to tell their story. Sometimes the effect is fun and campy, other times it’s just embarrassing. When Railsback arrives back on Earth, he helps the authorities track down the leader, a beautiful and frequently naked Mathilda May. It’s just a matter of time before the two star crossed lovers get together and create fireworks, destroying London in the process. The make-up effects are the best, especially when the vampire victims lose control and explode. Talk about tension headaches. Hooper and his writers, Dan O’Bannon and Don Jakoby believe that more is better, but in their quest to put it all up on the screen, they lost focus. VISION: [ ] EXCELLENT [ X ] GOOD [ ] RESUSCITATE [ ] D.O.A. Gorgeous widescreen transfer captures all that is good and bad about the film in sharp, vivid color. The only setback is that some of the film’s flawed visual effects are also vividly clear. No pan-and-scan version on the single-layer disc. HEARING: [ X ] EXCELLENT [ ] GOOD [ ] RESUSCITATE [ ] D.O.A. Here’s where “Lifeforce” really shows it’s strength. Excellent remastered 5.1 Dolby Digital Surround track captures the eerie Henry Mancini score and spreads it throughout the room. The sound effects and vocal tracks are nicely mixed, adding to the chaotic nature of some of the scenes. Bold basses accompany the larger-than-life moments. ORAL: [ X ] EXCELLENT [ ] GOOD [ ] RESUSCITATE [ ] D.O.A. Sub-titles in English, Spanish and French. COORDINATION: [ ] EXCELLENT [ X ] GOOD [ ] RESUSCITATE [ ] D.O.A. The DVD contains 15 minutes of additional footage not included in the theatrical version. I saw the film when it first came out 13 years ago, so I couldn’t tell you what was new and what wasn’t. All I know is that the film still seems long. Packaged with the usual extras like the theatrical trailer and scene selection. The DVD comes with an 8-page booklet that runs fans of the film and novices through the production process. PROGNOSIS: [ ] EXCELLENT [ ] GOOD [ X ] RESUSCITATE [ ] D.O.A. The patient will live, but only the collections of DVD fans who love this sort of thing. This entry was posted on Thursday, April 6th, 2006 at 4:53 am	and is filed under Film Review. You can follow any responses to this entry through the RSS 2.0 feed. Both comments and pings are currently closed.